$1.99 cover price, choice of covers. Marvel US #7, "Warrior School!" Publisher solicitation: It starts here! A look back at some of the most beloved Transformers comics from years past. This special monthly series rolls back cover prices and presents classic hard-to-find stories from the past two decades of Transformers comics. And to top off this special release, each issue will feature brand-new cover art from Ashley Wood (Metal Gear Solid), who will be presenting recreations of the original cover art. Nick Roche provides a variant cover with the a new perspective on the original cover as well. This debut issue looks at one of the most beloved TF stories of all time, �Warrior School,� originally presented in Marvel Comics� The Transformers #7! Marvel US #12, "Shooting Star!" Publisher solicitation: IDW continues their look back at some of the most beloved Transformers comics from years past. This special monthly series with roll back cover prices continues to present classic hard-to-find stories from the past two decades of Transformers comics. Once again, this issue features brand-new cover art from Ashley Wood (Metal Gear Solid) and Nick Roche, both of which present recreations of the original cover art. This issue looks at one of the most off-beat TF stories of all time, �Shooting Star,� originally presented in Marvel Comics� The Transformers #13! $2.49 cover price, choice of covers. Marvel US #14, "Rock and Roll-Out!" Marvel US #16, "Plight of the Bumblebee!" Publisher solicitation: IDW continues their look back at some of the most beloved Transformers comics from years past. This special monthly series with rollback cover prices continues to present classic hard-to-find stories from the past two decades of Transformers comics. Once again, this issue features brand-new cover art from Ashley Wood (Metal Gear Solid) and Nick Roche, both of which present recreations of the original cover art. 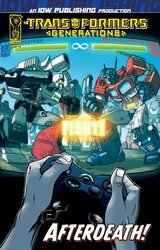 This issue focuses on a longtime fan-favorite Autobot with �Plight of the Bumblebee!� originally presented in Marvel Comics� The Transformers #16! Marvel US #17, "The Smelting Pool!" Publisher solicitation: IDW continues their look back at some of the most beloved Transformers comics from years past. 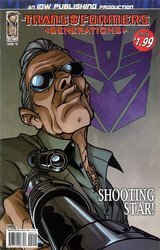 This special monthly series continues to present classic hard-to-find stories from the past two decades of Transformers comics. Once again, this issue features brand-new cover art from Ashley Wood (Metal Gear Solid) and Nick Roche, both of which present recreations of the original cover art. 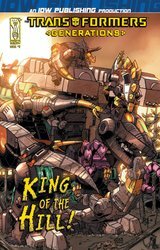 This issue takes us back to Cybertron with �The Smelting Pool!� originally presented in Marvel Comics� The Transformers #17! Marvel US #18, "The Bridge to Nowhere!" Publisher solicitation: IDW continues their look back at some of the most beloved Transformers comics from years past. This special monthly series continues to present classic hard-to-find stories from the past two decades of Transformers comics. Once again, this issue features brand-new cover art from Ashley Wood (Metal Gear Solid) and Nick Roche, both of which present recreations of the original cover art. This issue features the conclusion to �The Return to Cybertron� mini-arc with �The Bridge to Nowhere!� originally presented in Marvel Comics� The Transformers #18! Publisher solicitation: IDW continues their look back at some of the most beloved Transformers comics from years past. 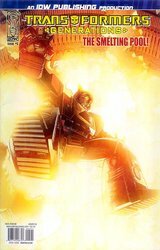 This special monthly series continues to present classic hard-to-find stories from the past two decades of Transformers comics. 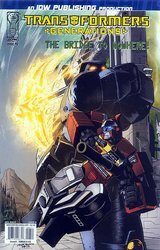 Nick Roche once again presents a new cover recreation of the original cover art. This issue features the story �Afterdeath!� originally presented in Marvel Comics� The Transformers #24! Marvel US #25, "Gone But Not Forgotten!" Publisher solicitation: IDW continues their look back at some of the most beloved Transformers comics from years past. This special monthly series continues to present classic hard-to-find stories from the past two decades of Transformers comics. Nick Roche (Transformers Spotlight: Shockwave) once again presents a new cover recreation of the original cover art. This issue features the story, "Gone But Not Forgotten!" originally presented in Marvel Comics' The Transformers #25! Marvel US #27, "King of the Hill!" Publisher solicitation: IDW continues their look back at some of the most beloved Transformers comics from years past. This special monthly series continues to present classic hard-to-find stories from the past two decades of Transformers comics. 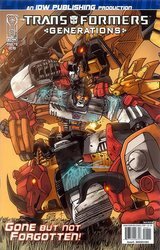 Nick Roche (Transformers Spotlight: Shockwave) once again presents a new cover recreation of the original cover art. This issue features the story "King of the Hill!" originally presented in Marvel Comics- The Transformers #27! $2.99 cover price, choice of covers. Marvel US #29, "Crater Critters!" Publisher solicitation: IDW continues their look back at some of the most beloved Transformers comics from years past. This special monthly series continues to present classic hard-to-find stories from the past two decades of Transformers comics. 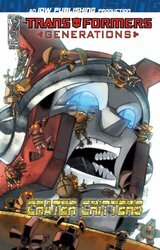 Nick Roche (Transformers Spotlight: Shockwave) once again presents a new cover recreation of the original cover art. This issue features the story "Crater Critters" originally presented in Marvel Comics' The Transformers #29! Marvel US #30, "The Cure!" Publisher solicitation: IDW continues their look back at some of the most beloved Transformers comics from years past. This special monthly series continues to present classic hard-to-find stories from the past two decades of Transformers comics. 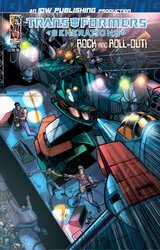 Nick Roche (Transformers Spotlight: Shockwave) once again presents a new cover recreation of the original cover art. This issue features the threat of Astrotrain in the story, "The Cure!" originally presented in Marvel Comics' The Transformers #30! $3.99 cover price, choice of covers. Marvel US #31, "Buster Witwicky and the Carwash of Doom!" Publisher solicitation: IDW continues a look back at some of the most beloved Transformers comics from years past. 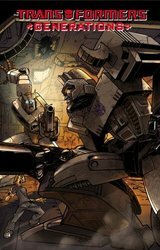 Nick Roche (Transformers Spotlight: Shockwave) once again presents a new cover recreation of the original cover art, along with a variant retro art cover. 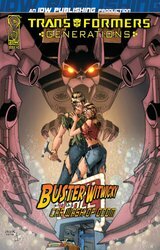 This month, the first year of reprints concludes with the return of Buster Witwicky in the classic "Buster Witwicky and the Car Wash of Doom!" originally presented in Marvel Comics� The Transformers #31! Reprints issues #1-6 of Generations.